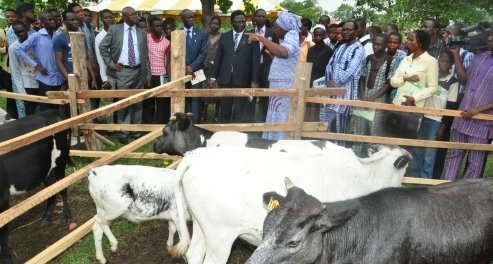 Pix shows rep. of the VC, the Dean, Student Affairs, Prof. Sam Oluwalana, who was accompanied by the Ag. Registrar, Mrs Christiana Kuforiji, presenting keys of the new vehicles to the beneficiaries. The Vice-Chancellor, Professor Oluwafemi Olaiya Balogun has handed over three brand new vehicles to the Colleges of Management Science, (COLMAS) Food Science and Human Ecology (COLFHEC) and the University’s Health Centre. Represented by the Dean, Student Affairs, Professor Sam Oluwalana, the Vice-Chancellor said the vehicles are neither ‘Tokunbo’ nor refurbished, but brand new, praying that, they will serve the purpose for which they were purchased. Professor Oluwalana while handing-over the vehicles, extolled the leadership qualities of the Vice-Chancellor, imploring members of the community to rally behind the Management in sustaining the tempo of excellence. Professor Oluwalana prayed for the divine protection of God over the vehicles, as well as those that will make use of them. Speaking with FUNAAB Bulletin at the event, the Dean COLMAS, Professor Bayo Oyelere, exalted the uniqueness of the Professor Balogun-led Management in the area of service delivery, describing it as incomparable in all the Universities he had served. He commended the efforts of the Management, pledging the readiness of the staff of the College to deliver on expectations, while also praying for a continuity of the leadership style. Also, the Director, Health Services, Dr. Olusola Talabi, who took delivery of a brand new Ambulance, stressed that the gesture was a demonstration of due recognition of health care, expressing the delight that the Ambulance had better sitting arrangement and equipped with an Oxygen facility for patients in transit. Dr. Talabi disclosed that the Ambulance is also equipped with Stretcher, Cabinet, First Aid Box, Drip Stand, Siren and Radio.